How costs to the consumer are affected by changes in energy and climate change policy. The Department of Energy & Climate Change (DECC) is committed to being open and transparent about the impacts of energy and climate change policies on energy costs for households and businesses. The prices and bills report reflects this commitment. It updates the analysis published in March 2013, and incorporates the impact of policy announcements made since then. Increases in energy bills in recent years have mainly been driven by rising international prices for fossil fuels, particularly gas. Other factors that affect energy bills include network charges, energy supplier operating costs and margins, and energy and climate change policies. These policies are designed to deliver low-carbon, secure and affordable energy supplies, help households and businesses save energy and support low income and vulnerable consumers. 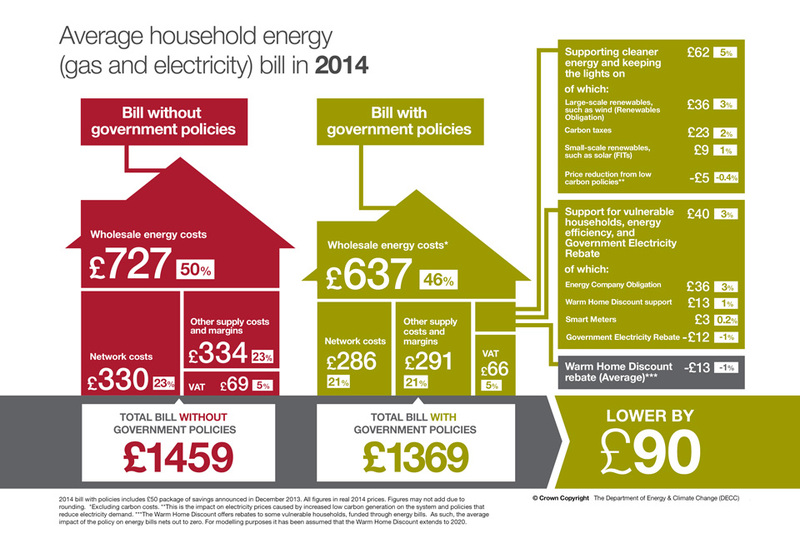 Infographic showing the breakdown of the estimated average household energy bill in 2014, before and after the impact of government policies. The costs of policies currently represent 7 per cent (£89) of the household dual fuel (electricity and gas) bill – with around 3 per cent supporting policies that help deliver savings for those that need it most (through the Energy Company Obligation and the Warm Home Discount for example). This compares to wholesale energy costs which account for nearly half of the bill. Moreover, these policy costs do not take account of the energy savings that evidence shows policies are delivering. For example, retro-fit cavity wall insulation has been installed in around 265,000 homes over the past 12 months and a cumulative total of 2.9 million cavities, 5.6 million lofts and 192,000 solid walls have been insulated through Government schemes since April 2008, the start of CERT. Evidence on actual energy consumption shows that these measures can deliver significant savings – from around £26 to £287 or more per installation per year. Accounting for energy efficiency savings delivered through government policies, the average impact of policies is estimated to be a net saving for households of around 6 per cent (£90) in 2014, compared to what bills would have been if these policies had never been introduced. Establishing a Government Electricity Rebate of £12 on household electricity bills in 2014 and 2015 delivered by energy suppliers. Reducing the cost of the Energy Company Obligation (ECO). While costs will vary across companies, the major energy suppliers have announced that the changes will result in an average £30-£35 off bills in 2014. In addition, electricity distribution network operators (DNOs) have taken voluntary action to reduce network costs in 2014/15, leading to a further one-off deferral of around £5 on electricity bills on average. supporting Ofgem’s reforms to make it easier for households to switch quickly and smoothly. Although the cost of policies will increase going forward in order to support increasing low carbon investment, policies will also deliver increasing energy efficiency savings – so that overall the costs of policies will on average be offset by the savings delivered by policies. The roll-out of Smart Meters across the household sector encouraging more energy efficient behaviour. Energy suppliers are required to take all reasonable steps to roll-out smart meters to all their domestic and smaller site non-domestic customers by the end of 2020. The continued replacement of energy using products with more efficient products that meet increasingly tighter EU efficiency standards mean when replaced, the new products available to buy will be more energy efficient. For example, sales figures show households replace fridges and washing machines after around 12 years on average and goods such as televisions after around 7.5 years. Minimum standards for boilers as required through Building Regulations means the gradual replacement of boilers with more efficient boilers. Around 10.5 million homes will replace their boiler between 2014 and 2020 as part of the natural replacement cycle of boilers. As a result, we estimate the households will be using around 14% less gas and 29% less electricity by 2020 than they would have been in the absence of policies. The impact of this on bills suggests that household bills will be an estimated £92, or 7 per cent, lower than otherwise. This is because the impact of policies in helping people to save energy, or use it more efficiently, is expected to more than offset the impact of policies to deliver low carbon investment. The large majority of households are expected to achieve savings through Products Policy, Building Regulations and Smart Meters, meaning even those households that do not benefit from any insulation measures or rebates can still reduce their energy use and save on their bills. Poorer households are typically hit hardest by rises in energy costs. However, households at the bottom of the expenditure distribution typically spend a greater share of their expenditure on energy and will therefore see the largest reductions in bills as a proportion of total expenditure i.e. any savings from measures will represent a larger share of household expenditure. These households are also more likely to be eligible for support through a number of policies and targeted directly by others. Requiring energy suppliers to provide direct support on energy bills through the Warm Home Discount (WHD) scheme, which supports around 2 million households per year. Changes to Affordable Warmth, as part of the wider changes to ECO due to come into effect from 1 April 2015, to incentivise greater delivery of insulation and heating measures to these vulnerable households. These changes are estimated to increase the proportion of households who benefit from measures delivered through Affordable Warmth that are in electrically heated households from the current figure of around 1% to around 20% between 2015 and 2017. The PRS Regulations will also help to alleviate fuel poverty, by requiring landlords owning the least energy efficient domestic PRS properties, many of which are electrically heated, to attempt to improve the energy efficiency of their properties before it can be let out. Energy-intensive industries (whose energy costs represent a significant proportion of operating costs) are worth around £52bn Gross Value Added (GVA) or 4% of the UK economy, and account for 35% of UK manufactured exports, supporting around 600,000 jobs directly, and many more in the supply chain. The impacts of policies on an energy-intensive user will depend on the extent to which they are eligible for the various measures of support. Those signed up to a Climate Change Agreement (CCA) will receive a discount on the Climate Change Levy for meeting energy efficiency or carbon saving targets, and every user will benefit from the cap on the Carbon Price Support (CPS) rate announced at Budget 2014. An energy-intensive user eligible for all of the announced compensation and exemption measures would see the impact of policies on their energy bills reduced by up to around 80% (subject to State Aid approval). In reality however, many companies and industries will be eligible for a mix of these measures and largely fall in the middle of the range of impacts. Compensation for the indirect costs of EU ETS. As at the end of October 2014, 53 companies had been paid over £44m, mitigating around 65% of these costs. Compensation for the indirect costs of Carbon Price Floor beginning in summer 2014 and which Budget 2014 extended to 2019/20. The Government received State Aid clearance in May and has paid out over £18m to 50 businesses as at the end of October 2014. An exemption to the CPF from 2015/16 for fuels used to produce good-quality electricity in Combined Heat and Power (CHP) plant for use on site. The Government is consulting with CHP operators with the aim of introducing in spring next year. Compensation from the costs of the Renewables Obligation (RO) and small-scale Feed-in-Tariff scheme (FITs) from 2016/17 to 2019/20. The scheme would compensate EIIs for up to 85% of the cost of the RO and small-scale FITs on electricity bills. This was announced in Budget 2014 and the Government set out its proposals for eligibility in a consultation in July 2014 (subject to State Aid approval). An exemption from future low-carbon electricity subsidy costs under CfDs beginning from 2015. The scheme would exempt EIIs for up to 85% of the cost of CfDs on electricity bills. The Government has set out its proposals for eligibility in a consultation in the summer. This relief is subject to State Aid approval. Together these measures are estimated to reduce the impact of policies by up to around 80%, subject to State Aid approval. The report his year includes new analysis on businesses that are small-sized users of gas and electricity. Their assumed consumption levels are based on the midpoints of Eurostat size-bands for small-sized gas and electricity consumers in industry, which is under the threshold for participation in the CRC Energy Efficiency scheme. Business energy bills are estimated to be higher in 2014 as a result of energy and climate change policies by 11% for small businesses, and 28% for businesses that are medium users of energy (and within the CRC). As noted above, for the majority of business, energy costs form a small proportion of total operating costs (around 3% overall), and the impact of policies is estimated to contribute to around 1% higher operating costs overall. The most effective way to reduce energy bills for business is to improve energy efficiency, and the Government has a number of schemes to help to this end. The Government recently consulted on Private Rental Sector regulations, which require landlords in the domestic and non-domestic sector to ensure that their properties meet certain minimum energy efficiency standards; it intends to lay the secondary legislation for the Regulations in early 2015. The aim of the CRC energy efficiency scheme is to incentivise cost-effective energy efficiency investment in large commercial, industrial and public sector organisations with annual electricity consumption of 6,000MWh or more, and is estimated to save 48TWh of energy to 2022. 27 March 2013 Updated to reflect latest figures. 22 January 2013 First published.